Enjoy no shipping charges when you purchase 6 bottles or more. This wine is fresh and delicious like a Pinot Noir. It is crisp and lingering like a Sauvignon Blanc. You’ll love it with almost any food and anytime of the year. This grape is a diva on the grape runaway. Simply delicious! All Georgos wines are handcrafted in small batches with premium, imported and sustainable fruit with no added sugar and low sulfites. 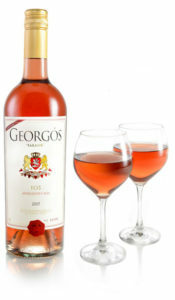 Georgos Super-Premium Wine is a collaboration of the best of the Old World and the Nu. This wine is named after the Greek goddess of love, Aphrodite, and the tiny Greek ancient island (circa 1,050 BC) in the Mediterranean Sea, Ios, known as a party island. Ios is one of the most beautiful islands of the Cyclades, like a flower, as its name “Ion” denotes. According to the ancient tradition, Ios is believed to be the homeland of Homer’s mother, while it is speculated that the great poet died and was buried here. Our winemaking is cutting edge, clean and very green. We hand pick and hand- sort the clusters, de-stem the berries without crushing, mechanically shake out the small shot berries and then hand-sort again to remove anything that isn’t perfect. These grapes were picked at precisely the right time for Rosé production. Good fermentation management helps produces wine that is stabile and clean. Like all Georgos Super-Premium Greek Wines, this wine is Handcrafted with low sulfites and no additives. This rosé is fresh and delicious like a Pinot Noir. It is crisp and lingering like a Sauvignon Blanc. You’ll love it with almost any food and anytime of the year. Ios enchanting and alluring balance, will make it a favorite pairing with a variety of salt-baked foods, white meat, pizza and cold plates.